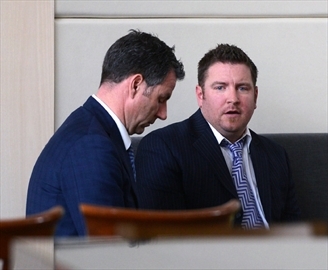 Guelph Police Constable Chris Panylo, right, talks with his lawyer Bernard Cummins prior to a his Police Services Act hearing on Police Act charges at the Holiday Inn on Scottsdale Drive last April. GUELPH — Guelph Police Chief Bryan Larkin says the service was unaware disgraced drug unit officer Const. Chris Panylo had any addiction or mental health issues prior to the overdose he suffered after consuming police-seized methadone in July 2011. In an interview Wednesday, Larkin also said it was the Panylo case that spurred an internal investigation into the use of steroids by Guelph officers that recently resulted in Const. Matthew Drenters pleading guilty to professional misconduct over selling steroids — to Panylo. He said that thorough probe found nobody other than Panylo and Drenters were connected to steroids within the police service. “If our investigation uncovered other persons or people of interest, I can tell you that we would have fully pursued any allegation, any suspicion,” Larkin said. Furthermore, Larkin said, Panylo may have suffered from an addiction, but did not seek out help from management or the police service’s “safeguard initiatives” developed to help officers cope with stress. “Somewhere through all of this, potentially, (Panylo) fell through the cracks and or didn’t feel comfortable,” Larkin said. In court proceedings, Panylo pleaded guilty in 2012 to stealing methadone seized during a 2011 raid on a Kitchener motel room and consuming it while on duty. He was placed on probation and paid a $1,000 fine. After overdosing on the methadone, a search of Panylo’s locker at Guelph Police Headquarters yielded 30 syringes, some laced with anabolic steroids. He pleaded guilty to five Police Services Act violations in April. On Sept. 26, his scheduled police act sentencing hearing ended abruptly. That unfolded after it was announced that the Guelph Police had accepted as a resolution to the matter Panylo’s resignation — which would come next April, after seven additional months of paid suspension. Larkin said he and lawyers for the police service felt “very confident we’d be successful in terminating Const. Panylo” through the Police Service Act hearing, but on Sept. 25, at 5:30 p.m., he received a phone call that resulted in another path being followed. The call was from Guelph Police Association president Const. Matt Jotham. Over the next seven hours, Jotham, Larkin, Police Insp. Howard McGarr, police prosecutor Jason Fraser, and Panylo’s lawyer, Bernard Cummins, hashed out the arrangement to end the Police Service Act proceedings in exchange for Panylo’s resignation. “There was an opportunity the night before to say we’ll engage in a negotiated settlement here, and we’ll do it in the confines of Guelph Police Headquarters, and we’ll just simply appear before the tribunal and withdraw all of the matters and say we can’t speak about it,” Larkin said. But he insisted the resignation be discussed publicly at the Sept. 26 hearing. The hearing officer didn’t object. Panylo was granted the additional period of paid suspension and Larkin and the Guelph Police achieved their goal: Panylo would likely never serve as a police officer again. Larkin lamented that the submissions during last week’s hearings would have given insight into the nature Panylo’s addiction, but did not occur because of the deal Panylo struck to end all disciplinary measures against him. He said Panylo will receive some pension benefits, as he paid into a pension for nearly 10 years as an officer, but will not receive any other pay related to sick time or seniority or any other ancillary benefit.